NJ 11th for Change/CD11: With McKeon not running, how do you see the race against Frelinghuysen? Thousands of postcards from NJ residents are being delivered to the NJDEP today, calling for rejection of the Christie administration’s $225M settlement for polluting New Jersey. About 3¢ on the dollar for a 10-year lawsuit filed for $8.9B. Rallying on the Statehouse steps are reps from NJ Sierra Club, NJ Citizen Action, Environment NJ, NY/NJ Baykeeper, Food and Water Watch, NJ Clean Water Action. They’re joined by assemblymen John McKeon and Carmelo Garcia, and Sen. Ray Lesniak. At a public hearing Wednesday, Lesniak testified that his read of the settlement language may allow Exxon to write off that $225M as a business expense. That would reduce Exxon’s cost, and shift the difference to taxpayers. Lesniak cites the word “alleged” in the language, which Exxon may use to distance itself from liability – enough to seek a state and federal tax break. Yesterday’s hearing was in Bayonne, one of the towns damaged by years of Exxon contamination. Everything about this deal stinks, including how it came about and the highly unusual way Chris Christie’s chief counsel inserted himself into the case. (Read Brad Campbell, former commissioner of the NJDEP). 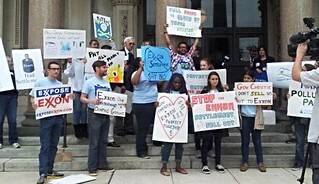 After the New Jersey Department of Environmental Protection proposed an eight-billion dollar lawsuit based on Exxon’s despoiling of numerous sites in New Jersey, the Christie administration is pushing through a $225 million settlement – less than three cents on the dollar – ending any future remediation or consideration for Exxon’s pollution. Today, Assemblyman John McKeon, chair of the Assembly Judiciary Committee, held a hearing to gather facts to try to determine if this settlement is in the best interests of the public. While such a low cash settlement without much public discussion may seem odd, it makes sense if you look at it through the lens of Governor Christie’s political aspirations. Settling for the low number now, and channeling most of that money into the general fund, provides Christie with another one-shot gimmick to enable him to boast of a balanced budget, even though that goal is constitutionally required. Waiting for prolonged litigation to force Exxon to pay its fair share would not help Christie, who will be long out of office by the time the lawsuits are settled. Following today’s public hearing of the Assembly Budget Committee, I spoke briefly with Assemblyman John McKeon about the budget process, priorities, and revenue enhancement. I was very saddened today to learn of the death of Gita Bajaj, who was the press liaison for Assemblyman John McKeon and former Assemblyman Upendra Chivukula. Gita always wore a smile and worked with me to provide stories for Blue Jersey readers. Her boundless energy and enthusiasm are how I remember her. She will be missed. Post Labor Day, election efforts now pick up for our State legislators: All 120 seats will be on the ballot in November. It’s time to get involved in donating and helping our candidates. Incumbents (generally) rule, but some seats are more tenuous than others and call out for help. Below is a list of incumbents in the primaries who received less votes than their challengers – preceded by their legislative district and an asterisk to denote the incumbent. The fact that an incumbent got less votes than a challenger is not an indication that the person will lose (primaries are peculiar animals), but it can raise a flag and suggests that the Democrats in the race merit more assistance. Likewise, the fact that Democratic Assembly challengers like Marie Corfield (16th) and Ed Zipprich (11th ) received less votes than the incumbents serves as an incentive for Democrats to provide additional help. Senate: 1st, Jeff Van Drew* (D), Susan Schmidt (R); 2nd, Jim Whelan* (D), Frank Balles (R); 7th, Diane Allen* (R), Gary Catrambone (D); 27th, Richard Codey* (D), Lee Holtzman (R); 38th, Bob Gordon* (D), Fernando Alonzo (R). 8th, no incumbent: Peter Barnes (D), David Stahl (R). 14th very close race with incumbent ahead by 61 votes: Linda Greenstein* (D), Peter Inverso (R). Assembly: 1st, Nelson Albano* (D) & Bob Andrzejczak* (D), Sam Fiocchi (R) & Kristine Gabor (R); 27th, John McKeon* (D) & Mila Jasey* (D), Angelo Tedesco (R) & Laura Ali (R); 38th, Timothy Eustace* (D) & Connie Wagner* (D) who dropped out from the race and was replaced by Joseph Lagana, Joan Fragala (R) & Joseph Scarpa (R). 14th, close race: Wayne DeAngelo* (D) & Daniel Benson* (D), Steve Cook (R) & Ronald Haas (R). Senator Robert Menendez: 2:30pm, presides over the Senate Foreign Relations Committee Syria Hearing with testimony from Secretary of State John Kerry, Defense Secretary Chuck Hagel, and Chairman Joint Chiefs of Staff General Martin E. Dempsey, Washington, D. C. Live webcast here or probably CSPAN. Buono/Silva Campaign: Democratic gubernatorial candidate Barbara Buono and Lt. gubernatorial candidate Milly Silva: 11:30am, Higher Education Press Conference, Rutgers University, Brower Commons, New Brunswick; Barbara Buono: 6:00pm, Hawthorne Democrats Cocktail Party, Brownstone House, 351 W. Broadway, Paterson. Governor and gubernatorial candidate Chris Christie: 11:00am, makes an announcement about New Jersey Institute of Technolog, Summit St., outside NJIT’s Central King Building, Newark; 2:00pm, Gotham Burger Co., 1383 Queen Anne Road, Teaneck. Email items for this column the evening before to BillOrr563@gmail.com.